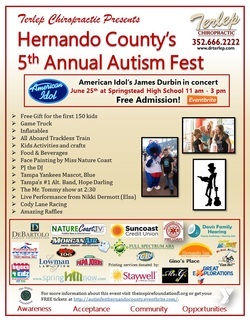 Hernando County's Autism Fest started as a F.W. Springstead High School, IB CAS project. The CAS requirement is a fundamental part of the IB program and takes seriously the importance of life outside the world of scholarship, providing a refreshing counterbalance to academic studies. 100% of the funds raised at this event benefit local 501(c)(3) non-profits supporting children with unique abilities in our community. Springtead High School student, Danish Hasan, created Autism Fest in 2011-2012 to fulfill his IB CAS requirements for graduation. The project took on a life of its own, bonding the community and helping connect resources with families that need them. Danish Hasan now attends USF, but continues to have a pivotal role in the planning and success of the event. The mission of Autism Fest is to bring the community together while providing a platform for awareness, acceptance and opportunities to those touched directly or indirectly by the autism spectrum disorder. Our mission is achieved by hosting this annual, community, family event and EVERYONE is invited to join the fun. The Inspire Foundation's vision for Autism Fest is to host this event in the different counties throughout Florida where they offer their services and eventually go national with the event.